SAPP President Datuk Yong Teck Lee has given Barisan Nasional until August to resolve the issues in Sabah. After August, there will be no guarantee that SAPP members will remain in Barisan, he said. 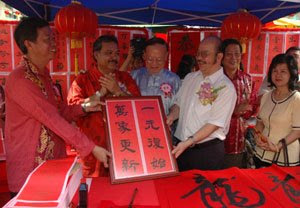 He however said the 16 Sabah MPs, who were speculated to cross over to Pakatan Rakyat on Wednesday, were not from SAPP. He added that this did not mean Barisan leaders should rule out the possibility that his members could leave the coalition in the near future. He said now is the time for Sabah to demand requests from the Federal Government. "This is the best time for Sabah but it is also the most important time for Barisan to do something for Sabah because if we do not do something, Sabah will be returned to its subservient role after August as September is the fasting month, October is the Hari Raya festivities and December is when the Umno general election will be held. "If nothing happens, an explosion will happen in January, where the Opposition will come into play," he told reporters Tuesday in the Parliament lobby here. Asked if he was approached by Pakatan Rakyat or the party’s de facto leader Datuk Seri Anwar Ibrahim, he said it was not necessary to be approached as Anwar had already announced an attractive offer during the election campaign. "Anwar is clearly a factor, the announcement of Sabah getting 20% of oil royalties means we will get RM2bil a year," he said. Yong also said the real issue in Sabah was not whether the Barisan MPs would cross over but the actual problems that Sabah had been facing. "A crossover only concerns the central Government because it is worried about its own stability," he said. He also said if nothing happens until next January, Barisan leaders would "come after those Sabah MPs who are speaking up now." Earlier, Yong met with Prime Minister Datuk Seri Abdullah Ahmad Badawi and requested that he resolve the issues in Sabah. He said Abdullah was concerned and said that the Government would look into the issues. Yong also said the issues such as illegal immigrants and cooking oil subsidies were not new but Barisan had not been doing anything to help them. Citing the example of the Cooking Oil Subsidy Scheme, he said it was not fair for the Government to force Sabah palm oil planters to bear the subsidies since June 2007, when cooking oil is consumed by the whole country. "Sabah planters made up two-thirds of the numbers in the country so basically they are paying two-thirds of the subsidies. "We have raised this issue but the Government kept saying they will look into it and they have been looking into the issue for 11 months already," he said.